Leinster flanker Josh van der Flier will start for Ireland against New Zealand tomorrow after Dan Leavy was ruled out with injury. Ulster's Jordi Murphy comes onto the bench for the game after his former Leinster team-mate did not train with the side at their Captain’s Run this morning. Leavy also missed training on Thursday, but was still selected in the team to start. Joe Schmidt was upbeat on his chances of taking the field, describing the player’s problem as "full body soreness", but the IRFU today confirmed that the flanker won't take part in the match. 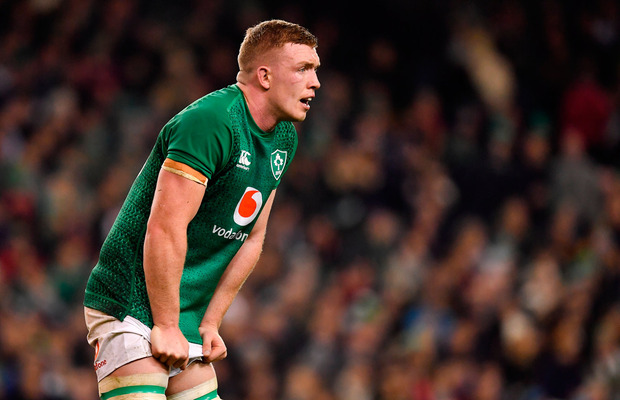 "Dan Leavy had a fitness test this morning and it was decided he was not 100 per cent, so he will miss the match due to general tightness," an IRFU spokesman confirmed. Although the loss of Leavy, having already lost Seán O’Brien to a broken arm suffered in the win over Argentina last weekend, is a major blow, Ireland are blessed with depth in the openside position. Van der Flier has faced the All Blacks twice, while Murphy started and scored in the win in Chicago before he went off with a torn cruciate ligament. Speaking last weekend, Schmidt was highly complimentary of van der Flier’s performance against the All Blacks in Dublin in 2016. "I don't know if you remember the last time we played the All Blacks here, Josh van der Flier had a phenomenal entry into the game. He had two searing line-breaks and really impressed," he said. "So, I know that's two years ago now and it's all about the current context and what people can deliver in the next seven days but it all feeds into a melting pot that we'll have a look at and make some decisions on the back of. "It's nice to have that back-up." Speaking about Leavy after naming him in the team on Thursday, he said: "With Dan he's only really recently back playing after injury so we're just trying to manage him. "He trained very well on Tuesday, but he's had a bit of soreness. We’re expecting he will be up running and ready. "He's just been sore from the week before. Full-body soreness. Nothing too specific, but he was stiff and sore. "As a result he didn't sleep overly well, which is another warning sign for us that if we push him too hard he would fall under that fatigue and not be better."